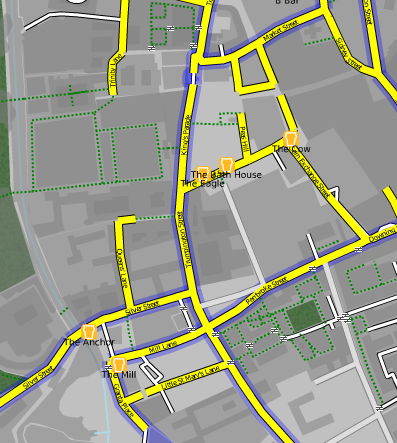 Republished from OpenGeoData. Nov. 30, 2009. OpenStreetMap users will know all about Potlatch, the online editor that appears when you click the ‘Edit’ tab on the site. Well, there’s a whole new version coming soon! Potlatch 2 is a complete rewrite still with the same principle in mind: an editor which hits the right balance between speed, ease-of-use, and flexibility. It’s under very active development at the moment and I’ll include a link at the end of this post where you can have a look. But there are four big new features – and one behind-the-scenes change – to tell you about first. Potlatch 2 has a friendly, intuitive tagging system. The mapper can use graphical menus, dedicated fields, and icons to get the tagging just right – without the need to remember tag names and values. 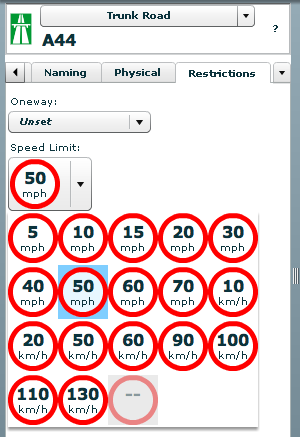 For example, you can choose highway types from a set of icons, then add a speed limit by selecting the appropriate restriction sign. All this is fully customisable using a straightforward presets file. Using this, you can create your own favourite tag combinations. Potlatch 2 has an all-new rendering engine far in advance of the current one. With road names, patterned fills, rotated icons, and much more, the editing experience can be like working live on the familiar Mapnik rendering, the cyclemap, Osmarender, or anything you like -making it much more approachable for the beginner. Just like the tagging, the rendering is easy to customise. It uses a special form of CSS, called MapCSS, which lets you create wonderful-looking maps with just a few lines of text. The tagging and rendering together make Potlatch 2 ideal for ‘vertical’ mapping applications, such as a cycle-specific editor or a building/addressing editor. Stylesheets aren’t just about making the map look pretty: you can create stylesheets to help your mapping, such as one that highlights roads without names. The rendering engine (Halcyon) is available as a compact (<100k) standalone component which you can embed in webpages, so your custom maps can be used outside Potlatch 2. Continue reading at OpenGeoData . . . This entry was posted on Monday, December 14th, 2009 at 7:00 am	and is filed under Best practices, Flash, Geography, Interactive, Mapping, Maps in the Wild, Mashup, Promote, Software. You can follow any responses to this entry through the RSS 2.0 feed. Both comments and pings are currently closed.